At least 81 conservation areas in London, nearly one in five, are at risk of losing their unique character, English Heritage has said. The organisation said 81 of the 486 conservation areas surveyed in London are threatened by "neglect, decay or damaging change". Harmondsworth Village in Hillingdon, Leopold Road in Merton and Noel Park in Haringey feature in the 'at risk' list. English Heritage listed plastic doors and windows as the biggest threat. The London list is part of the national Heritage at Risk register unveiled by English Heritage. The list identifies areas that have deteriorated in the last three years or are at a risk of doing so in the next three years. 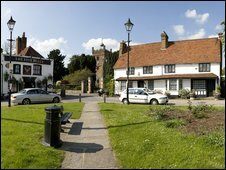 Harmondsworth Village in west London was designated a conservation area in 1970 but the open countryside famed for being a medieval settlement could lose its character because of the expansion of Heathrow Airport, according to English Heritage. It said the third runway would eat into the green acres surrounding the village. Leopold Road in south London became a conservation area because of "the cohesiveness of the height of the buildings" but that is threatened by "loss of historic features, inappropriate shop fronts and the dominating presence of traffic". Noel Park estate in north London has also suffered due to loss of original windows and doors, rendering, inappropriate roofing materials and loss of boundary walls, the organisation said. It blamed plastic windows and doors for affecting 83% of at-risk areas, with poorly maintained roads and pavements, street clutter, loss of garden walls, hedges and satellite dishes listed as predominant threats to an area's character. English Heritage named Hampstead Garden Suburb in Barnet, north London, as "a textbook example of community engagement and a benchmark for other conservation areas". It also praised Islington Council for redeveloping the King's Cross area in keeping with the Grade I listed St Pancras Station and King's Cross Station. Webb Estate in Croydon, south London, was also classed as a "well managed conservation area" for maintaining its Arts and Craft style houses. Nigel Barker, English Heritage's head of regional partnerships for London region, said the capital's conservation areas were "an integral part of the fabric of this great city" but "many are under pressure". "It (the survey) has shown the wide range of challenges facing these special areas but also demonstrates how active management can make a difference." The areas in the list were highlighted by local councils.